What do you do with spare CD-ROM drives ? Over the past few years, I've collected a large number of spare computer parts - including cards, cables, and drives; all of them in perfectly working order. Some items become obsolete (such as ISA cards) and eventually find their way to the trash. 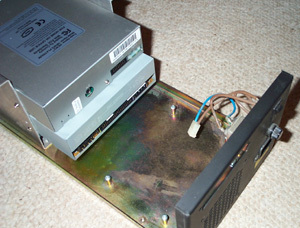 CD-ROM drives are generally useful - it's usually possible to mount them in a PC if you have spare 5-1/4 inch bays and available IDE channels. The older slower drives are not too useful for data access but can still serve as dedicated audio playback devices. Another spare part I have is an old metal case that used to house an 8mm DAT backup tape drive. This case looked like it would hold the CD-ROM drive nicely. The unit measures 15-1/2 inches deep, 7 inches wide and 5-1/2 inches tall. The front has openings for two 5-1/4 inch devices. 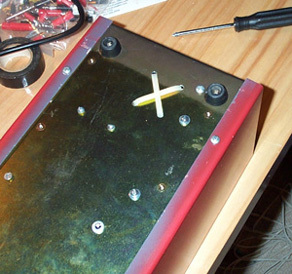 Inside are pre-drilled supports to hold the 2 devices in the bay (these used to hold the SCSI DAT drives). 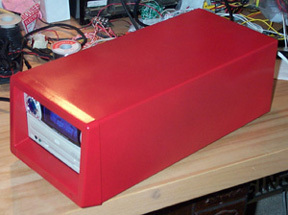 After accounting for the depth of the CD-ROM drive (about 8 inches), there is sufficient room in the rear for a power supply. If I mount the CD-ROM drive in the lower of the 2 bays, there is plenty of room above it to house some sort of control and power amplifier. I can then cover the upper device bay on the spare 5-1/4 inch faceplate. Then came another twist. When I told my brother what I was up to, he gave me a NewQ 3379 Platinum tuner/preamp unit from his spare parts bin. Like the CD-ROM drive, the NewQ 3379 is housed in a 5-1/4 inch chassis and is designed to be mounted in a device bay. By wiring a PC's sound card's output through the NewQ 3379's preamp stage, the the NewQ 3379 can further process all PC audio outputs with various surround, hall and reverb effects. The NewQ 3379 also comes with a remote control. At this point, I should mention my project parameters. As a DIY hobbiest, I firmly believe in defining a set of parameters before beginning any project. If I had infinite resources (time, money, patience, etc.) I would probably never finish any projects. Feature creep would guarantee endless cycles of changes. Setting goals helps control the building process and defines an end state. This is mainly a recycling effort. I don't need another CD player and if I did need one, I could just buy one off the shelf that would give me lots of useful features. But I do have lots of idle "stuff" so let's use it up ! This also means it must be low cost. It must be safe to operate. That translates to low heat, electrically safe, relatively kid-proof. I don't need lots of power. The JLB 12 Watt Stereo Amplifier from Apex Jr.
With the NewQ 3379, I no longer had to build a control preamp, but I still needed a power supply and amplifier. The power supply was a no-brainer; building it won't be a problem though making it fit in the case could be a challenge. 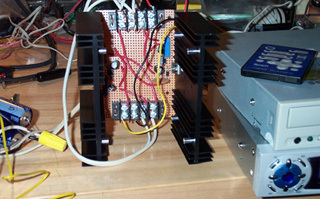 Building my own amplifier would have been fun as well, but I didn't have the parts necessary on hand. Weighing my time, effort and cost, I opted for the 12 Watt JBL stereo amplifier from Apex Jr. At $9.95, it's almost disposable (in case I decided to ditch it !). 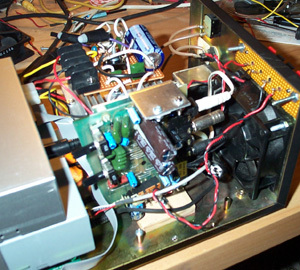 This is a stereo amp on a PCB, complete with wall-wart transformer. It is fully assembled and ready to use. It's not too hard to figure out that this amplifier was originally used in a multimedia speaker system. 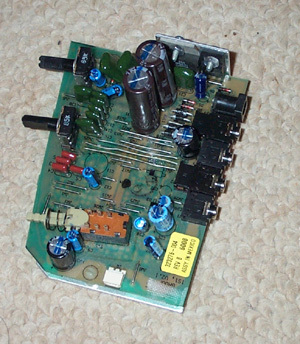 The PC board was mounted in the right channel speaker where it received a stereo signal from a PC sound card. There is an output to the left channel speaker. This is a pretty standard design. There are 5 connectors in the rear edge of the PCB - power supply in, left speaker out, stereo in and two no-connection jacks. I don't now what the latter jacks are for, nor did I bother to trace the PCB layout to see if they have any real use. On the front are a bass tone control knob, and volume knob and an on/off push-button switch. The right channel output is near the bottom of the PCB. 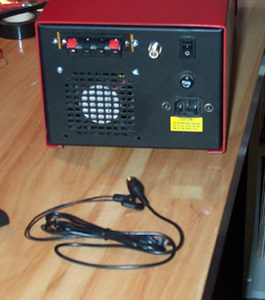 The amplifier is based on a TDA7360 stereo audio amp "chip". By itself, it offers a fixed gain of 20 dB with an input supply range from 8 to 18 VDC. A PDF spec sheet can be found here. SGS-Thomson calls this a 22 watt part but this is the sum of both channels. With a 14.4 V supply, the TDA3760 is rated at 12 watts into 1.6 ohms, 11 watts into 2 ohms, 8 watts into 3.2 ohms and 6.5 watts into 4 ohms; all per channel. This isn't much especially at "real" impedance levels, but since my goal wasn't to blow the house down, this would do. The TDA7360 is bridgeable (though this PCB has no support for it) and I looked briefly at using two amp boards, each bridged for more output. But I eventually decided to run with just one board since I didn't have enough room in the case to mount two. To interface the amp board to the rest of the pieces, I made small patch cables to get to the left and right channel outputs. 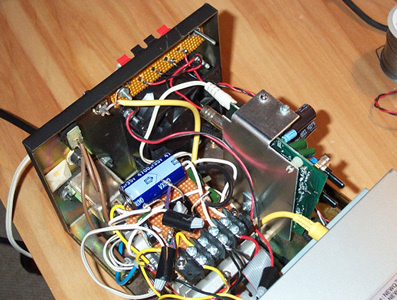 The amp PCB is mounted vertically via an L-bracket mounted into the unit's heat sink. This required that I disassemble the heatsink from the PCB but that proved to be very simple. The L-bracket is mounted to a small piece wood which in turn is mounted to the chassis. For power, I ripped apart the wall-wart that came with the amp and strapped it to the bottom of the case with two plastic cable ties. The NewQ 3379 has no documented power consumption ratings anywhere - not in the user's manual that came with the unit, nor on their web site. 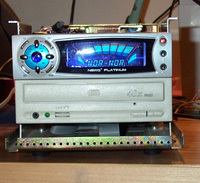 The CD-ROM drive is rated +12V @ 1.2 A and +5V @ 0.7 A. To determine my power needs, I dusted off a pair of variable regulators I built years ago and hooked them up to a 12.6 VAC @ 5A transformer. After verifying that everything was working, I measured the total current draw with the CD-ROM and NewQ 3379 connected. 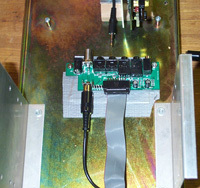 The +12V rail peaked at 1.2 A during the initial motor spin-up and settled to under 0.5 A while playing a CD. The +5V rail peaked at 0.4 A and settled to a little more than 0.3 A. Looking at my parts bin, I decided to use a LM7805 regulator for the +5 V rail and a LM317 for the +12 V rail. I have an older LM7812 but unlike the newer units that are rated at 1.5 A, mine was only rated for 1 A. It probably would have worked just fine since the 1.2 A current draw was for a very short time but the 1.5A rated M317 was the safer choice. The LM317 is an adjustable positive regulator so I had to add a couple of resistors to tune the output voltage. Ultimately, I tuned the +12V rail to +12.09V and the +5 sat at +4.995; all well within the 5% margins dictated by the ATX power supply specifications that computer I/O devices are designed for. The power supply is a triple decker affair. At the bottom is a 12.6 VAC 3A transformer from Radio Shack. 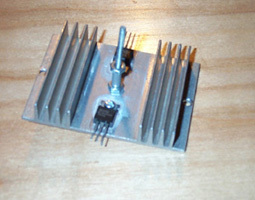 Above this is a single heat sink holding both voltage regulatorst. Both TO-220 regulators are insulated from the heatsink. 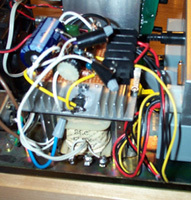 Above the heatsink is a small board with the rest of the power supply parts - a 4700 uF capacitor, a full-wave bridge rectifier, voltage control resistors and some bypass caps. A terminal strip delivers the power to the devices. To deliver power to the CD-ROM and NewQ 3379, I used a cable from an old defunct AT power supply. The four color coded wires are wired to the termial block (red is +5, yellow is +12, black is ground). This unit is entirely sealed. It comes with an I/O bracket that contains a small PC board. 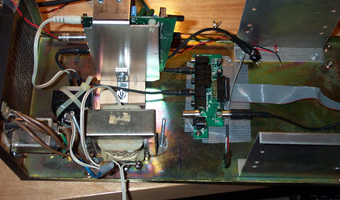 This PCB and included cables re-routes signals from a PC sound card back into the computer chassis and then to the NewQ tuner/EQ via a ribbon cable. There is also an antenna input. Refer to the NewQ web site for information on the 3379. At the rear of the housing, I added three more parts - a fan, a speaker terminal strip, and an antenna jack. Finally, I spray painted the housing with red enamel paint. Yes, the paint was also "recycled" - it was left over from some other project and was just sitting there on the shelf. The fan is an 80mm case fan consuming 0.15 A from the +12V supply. This is a relatively slow, weak and quiet fan. 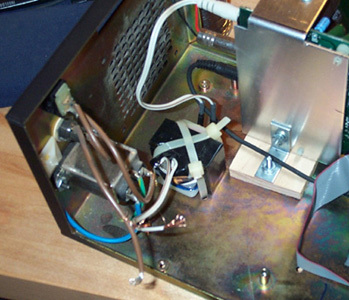 The power supply transformer delivers a little over 14 volts past the bridge rectifier so under normal operating conditions, the main power supply heatsink dissipates about 4 watts of heat. The JBL amplifier add to this heat of course. To see if I needed a fan, I played an entire CD (about 1 hour) at full volume and opened up the case. Without the fan, everything was hot to the touch. The top of the case itself was warm. With the fan running, only the power supply heatsink was warm; the amplifier was nice and cool and the airstream out the rear was cool. Given the large difference in heat buildup, I decided to keep the fan despite the added noise. Note that the case does not have vents on its top. If it did, I would have avoided the fan entirely and let convection cool the interior. The case does have air intakes under the front bezel thus creating a nice airflow path through the interior for the rear mounted fan. 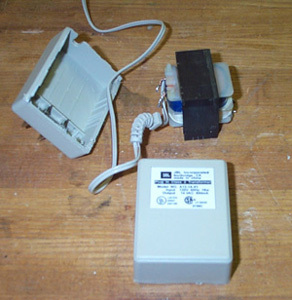 The terminal strip consists of four push-type spring-loaded connectors. 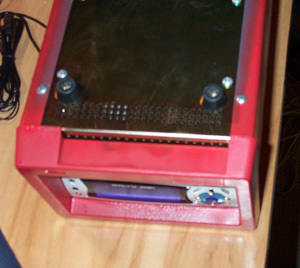 The case already had a cutout in the rear - it used to hold a SCSI connector for the 8mm drive. I mounted the terminal strip to a small perforated board and mounted that board through the cutout. The antenna connector is just a panel-mount F-jack. 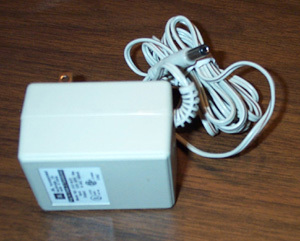 The NewQ 3379 has an RCA connector for an antenna signal and comes with a wire antenna. I ripped apart an old RCA patch cable and wired it between the F-jack and tuner. The rest of the case had all the basic things I needed - 3-prong power receptacle with EMI filter, fuse, and power switch (in the rear unfortunately). I must say that I'm really happy with the results. The unit weighs a ton and is rocks solid. The fan is a bit noisy when it's on and not playing music, but put on some music and fan noise vanishes. The only parts I had to buy were two TO-220 insulating kits, a 4700 uF capacitor, the speaker terminal strip and a panel mount F-jack, all from Radio Shack. 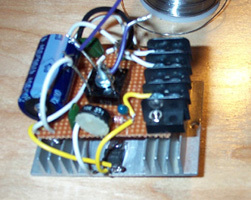 Replace the JBL amp with an LM3886 (or similar) amp. Mount a front panel power switch. 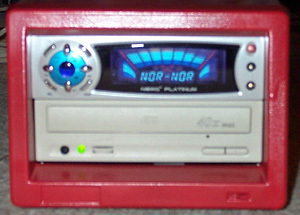 Make use of the digital out on the CD-ROM drive to avoid using the unit's DAC.